The Royals sign RHP Kris Medlen for $8.5M over 2 years. WHAT. ON. EARTH. IS. HAPPENING. We thought they were finished, but apparently they’re not! The Royals have added to their week of free agent pick ups – Kendrys Morales, Alex Rios and Edinson Volquez – and have agreed to a contract with Kris Medlen that will pay him $2M in 2015 and $5.5 in 2016 with a mutual $10M option for 2017 or a $1M buyout. Dayton, you dog, you. Incredible work. All this time we knew they needed three pieces – RF, DH and SP – and yesterday’s Volquez signing just didn’t seem to be the answer for most of us. He’s fine, and was the best option at that price, but we felt underwhelmed, deflated. The other option would be to take a gamble on a pitcher who missed 2014 due to injury. 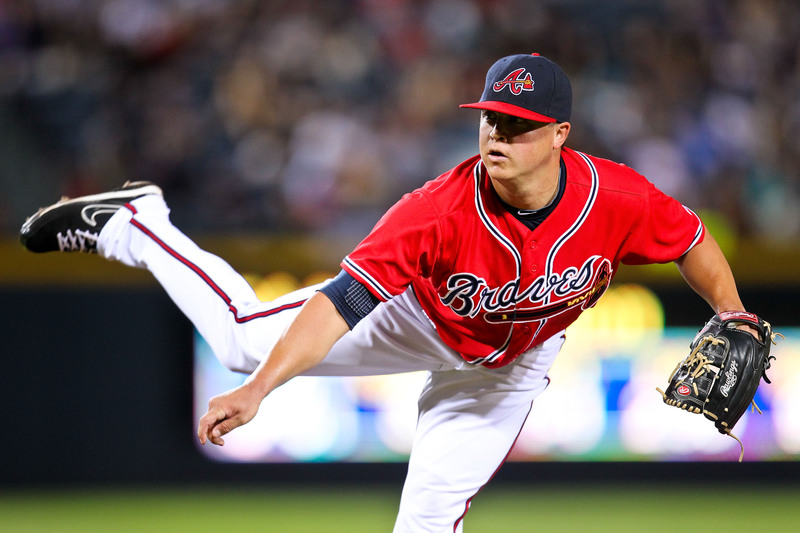 Kris Medlen missed last season due to Tommy John surgery and was non-tendered by the Braves. What do you get from a guy coming back from Tommy John surgery? Who knows. Could he be the guy who threw a 2.47 ERA from 2012-2013 or would he be a shell of himself? And is that worth a $5-6M gamble? Hmmm. Answers please, Dayton Moore. I never believed for a moment that they would pick up both Volquez and Medlen, but Dayton Moore has gone and stirred things up even more with this move. They’re essentially opposite players in terms of their potential ceiling, so paired together, this feels like a brilliant move. On the one hand, Volquez is coming off his best season as a starter, and we pretty much know his ceiling is his 2014 season. His control is questionable, and he’s not going to be lights out, but he’ll eat up innings. You know what you’re getting with Edinson Volquez and it’s not great. He’s…fine. But with Kris Medlen, we really have no idea what we’re getting. Medlen was incredible with the Braves from 2009-2013. He has a career 2.95 ERA. He strikes out nearly 8 batters per 9 innings. He walks less than 2 batters per 9 innings. His career WHIP is a notch above 1. Kris Medlen was going to be one of their top starters. He was entering the prime years of his career. Instead, he had to undergo his second Tommy John surgery of his career. So what are we getting with Kris Medlen? It’s a lottery ticket basically, but the upside is astronomical. We’re paying $2M in 2015 for a gamble on a guy who could come back from injury and be an absolute stud in our rotation. He probably won’t be ready by Opening Day, and with the depth of the Royals rotation now, we may let him take his time and trot him out there sometime in June. Even then, he would probably be a back of rotation guy for this year, pushing Guthrie or Volquez back to the bullpen. He’ll have to work his way back to his old role as a top of the rotation guy. This also takes the pressure off the bullpen to have additional long men available rather than having to turn to Hochever/Frasor early and making Herrera/Davis/Holland work more innings than they should be throughout the season. This also almost guarantees that Brandon Finnegan starts the season in the minors. Kris Medlen has ace-calibur stuff. A fastball in the upper 80s, but pinpoint control. His changeup and his curveball are his best pitches. From 2012-2013 only two pitchers (Cole Hamels and, interestingly, Jason Vargas) generated more value out of their changeup than Medlen did, and only 8 players had a more valuable curveball. Basically, Kris Medlen has the stuff to potentially be a top of the rotation type of guy, as long as he can jump back from TJS #2. So this year we’ll spend $2M on a second-half starter. We can expect around 80 innings from Medlen this year, but could be really special in 2016 if he can work back to his old form. We have unbelievable depth at starting pitching suddenly. Which is very important, and we were fortunate to not have any injuries to our rotation in 2014. High five to one of baseball’s best training staffs. With the addition of Kris Medlen, the pressure on Ventura and Duffy is lifted, and you have one of the highest upside pitchers waiting for the ball come midseason. So in 2015, the Royals are on the hook for $6.5M for Morales, $11M for Rios, $10M for Volquez and $2M for Medlen. That’s $29.5M in 2015. Rios is gone in 2016, but the second year for both Morales and Medlen is more money, so it’s $9.5M for Morales, $10M for Volquez and $5.5M for Medlen. That’s $25M in 2016. We are sure to lose either Greg Holland or Wade Davis’s option for that year (if not before this season), which reduces that commitment even further. All that to say, we’ve had a busy busy week and our pocketbook isn’t on the hook much at all. Suddenly this move makes yesterday’s move feel completely justified. By signing veteran guys to modest money, if any of these four exceeds expectations, we’re going to come out way on the plus side on these deals. And we didn’t have to give up anything but cash to do it. I absolutely love this deal. Bravo, Dayton Moore. Bravo, David Glass. I thought this team was done with signings yesterday, but apparently I was wrong. This team is still moving and shaking and who knows what might be in store for tomorrow. What a crazy busy and exciting week in the life of Royals baseball fans. Phew. …SO IS IT SPRING TRAINING YET, OR WHAT?! Previous Previous post: The Royals sign RHP Edinson Volquez for $20M over 2 years. Next Next post: Christmas Board Games, 2010-2014. This year’s purchase: Camel Up.